With all the different mop designs out there, it can be tricky determining which type is best for your tile and grout floors. This article from Bustle talks about the best mop styles to use. Tile floors are great in kitchens, bathrooms, and other high traffic areas of your home. They’re durable and, for the most part, easy to clean. But the care they require is different from hardwood or linoleum — and the best mops for tile floors address those needs, ensuring yours remain sparkling and clean. Best for: Areas that experience a lot of foot traffic or that are located in easily-stained rooms like kitchens and bathrooms. Why it’s great: Instead of having to push down hard on your mop to dig up dirt from tile and grout, a cordless spinning mop has rotating, washable mop pads that provide enough pressure and friction to loosen caked-on spills or trapped dirt without scratching floors. Best for: Traditionalists who still favor a mop and bucket duo over ones with built-in tanks. Why it’s great: Unlike its fancier counterparts, this affordable mop won’t limit you in terms of the types of floor cleaner you use. Its simple design is also incredibly easy to use – but with a bit of modern flair. Its bucket features a foot pedal that you step on to automatically wring out the mop and control just how much moisture you apply on your tile floors. Best for: Fragile tiles and anyone who tries to avoid harsh cleaners. Why it’s great: A steam mop sanitizers floors and breaks up dirt without scrubbing, which can often lead to scratches. Best for: Tile floors and grout, obviously — but also tile walls, ceilings, and tubs (aka bathrooms). Why it’s great: This is more of a tile scrubber than a mop, but unlike most abrasive spinning scrubbers on the market, this one has a gentler head and can be used in conjunction with your favorite cleaner on just about any tiled surface. 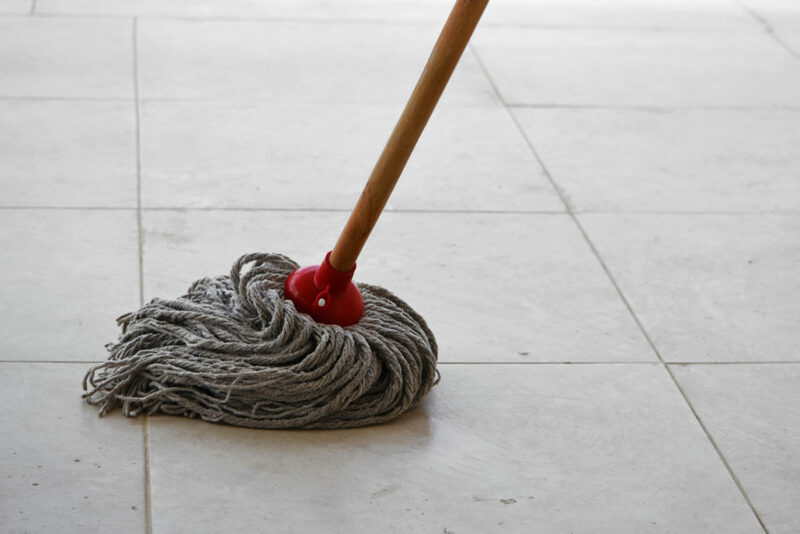 Click here to view the original article with examples of these mops types that are on the market.